Utopia Bedding Mattress Pad Review - Worth It or Waste of Money? 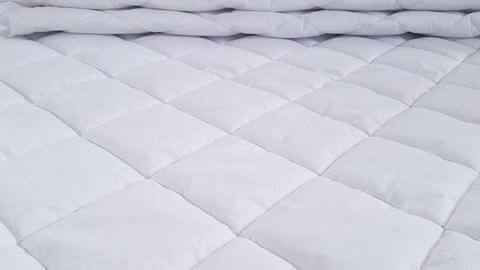 What Is the Utopia Bedding Fitted Quilted Mattress Pad Made From? How Does the Utopia Bedding Fitted Quilted Mattress Pad Perform? How Do You Wash the Utopia Bedding Fitted Quilted Mattress Pad? How Much Does the Utopia Bedding Fitted Quilted Mattress Pad Cost? Regardless of what brand you’re looking at, mattress pads tend to look alike: white, quilted and put together like a fitted sheet. There’s very little you can differentiate visually. Even the stitching on top is almost always a diamond quilting design. 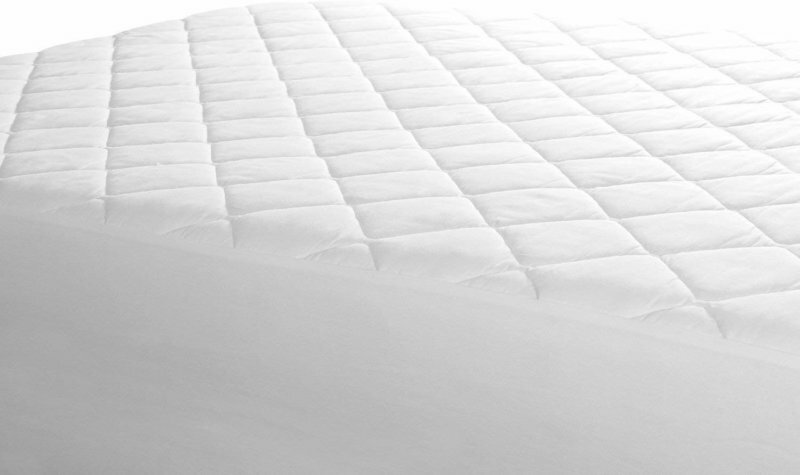 The Utopia Bedding Fitted Quilted Mattress Pad is no exception. However, Utopia Bedding is a brand under New York-based Utopia Deals, which has been around since 2011. They specialize in lifestyle items and focus on e-commerce. Does this concentration on online retail make a difference? What else sets Utopia Bedding and its mattress pad apart? Let’s find out together in this review. The Utopia Bedding Fitted Quilted Mattress Pad is made from brushed microfiber, a cotton and polyester fabric blend, and siliconized polyester fiberfill. There’s also elastic all around the bottom edges—not just at the corners. The surface of the mattress pad features the brushed microfiber, while the cotton and polyester blend is used in all other places fabric is needed. Siliconized polyester fiberfill is uesed for the padding within the quilting. Curiously, the Amazon product page notes that this mattress pad has vinyl backing. It does not, according to some disgruntled customers and—to be fair—according to the official Utopia Deals website. Microfiber is a fine synthetic fiber commonly made from polyester. Brushed microfiber textiles go through an additional brushing process which makes the resulting fabric very soft. An untrained eye or hand may find it difficult to differentiate cotton from high quality microfiber at first pass. Microfiber fabric used in bedding is often breathable, moisture-wicking, wrinkle-resistant and very durable. This material is also less prone to shrinking and pilling. Fiberfill is a synthetic material made from processed and blown out polyester fibers. Siliconized fiberfill is made from polyester fiber processed with silicate material, which makes the end product resistant to many common allergens. The silicate material functions by stiffening up the polyester fibers, although this doesn’t affect the overall softness of the fiberfill. In fact, this man-made batting or filling is a popular cotton or down alternative in part due to its plushness. The siliconized fiberfill used by Utopia Bedding, in particular, is said to be sanitized high loft polyester containing no bleach or dye. Will the Utopia Bedding Mattress Pad Fit Your Mattress? The Utopia Bedding mattress pad is available is made in twin, twin XL, full, queen, king and California king sizes. These all follow standard US mattress dimensions, so Utopia Bedding products are almost certain to fit your mattress. As its full name implies, the Utopia Bedding mattress pad is made to slip over and be secured easily over your bed like a fitted sheet. On Amazon, it’s noted that it can stretch to fit up to a 16-inch thick mattress—but on the official Utopia Deals website it’s indicated for mattresses “up to 15 inches deep” only. The majority of feedback notes that the Utopia Bedding Fitted Quilted Mattress Pad very comfortable and worth its price. However, there are several durability issues raised. One persistent negative comment we noted on Amazon is the fact that this mattress pad is not waterproof. It’s not marketed as a waterproof product, though! Likely it’s the incorrect “vinyl-backed” information on the product page that causes the disconnect. Another top complaint we came across is that this mattress pad falls apart after a few washes. Curious, though, that there are just as many reviews praising it for its durability. It could be an issue as small as washing it too frequently, or as huge as inconsistent product quality. We are more inclined to believe the latter, though. There are several verified customers that complained about loose or missing stitches, and the fabric or elastic tearing upon first use! These unsettling accounts are few and far between, though. How Does the Utopia Bedding Mattress Pad Feel? It is generally regarded as soft and comfortable, it a little thinner than expected. The brushed microfiber top provides a smooth and breathable top that’s gentle on the skin. The quilting prevents the padding from bunching up or clumping together, so the feel remains smooth and not lumpy. You may feel that the Utopia Bedding mattress pad makes your bed warmer if you have a mattress known for its surface cooling properties, like the Bear mattress or the GhostBed Luxe. We’ve seen some reviews complain about this, but it’s not so much the mattress pad adding or retaining heat as it is adding more material between you and whatever cooling agent your mattress uses. It doesn’t help that the majority of the material used is polyester, though. Is the Utopia Bedding Mattress Pad Hypoallergenic? The word “hypoallergenic” doesn’t appear anywhere in its product information, but it is said to be “allergen free” and an aid in protecting your mattress against dust mites and allergens. Generally, polyester-based material used in bedding products are as close to hypoallergenic as synthetic fabrics can get. However, this is all for naught if you suffer from textile dermatitis specific to polyester. If this is the case, you may be better off looking for an all-cotton alternative. Does the Utopia Bedding Mattress Pad Smell? Though it’s packed in plastic, the Utopia Bedding mattress pad does not smell when it is first taken out of its packaging. Off-gassing happens whether we can smell it or not. A noticeable odor is not a great way to measure the amount of off-gassing, or even how dangerous the fumes are. However, it can be an unpleasant experience, especially for products that will be in close contact to you all the time—like a mattress pad. The Utopia Bedding mattress pad not only has no history of giving off any odors, but it also doesn’t contain foam. The latter is a material that commonly comes with pronounced off-gassing. Machine wash on cold using a delicate or gentle setting and mild detergent. Do a rinse cycle twice. Use a dryer with a large capacity if possible, and tumble dry on the lowest heat setting possible. Use only a small amount of detergent. Dry carefully and completely before storing or using again. As of this writing, one queen size Utopia Bedding mattress pad is available on Amazon for $24.99. You can also purchase a box of 10 for $149.99. If you purchase a box of 10 on the official Utopia Deals website, though, it’s considerably more affordable at $99.20! That makes the price per piece on the official website only $9.92—less than half the price of a single Utopia Bedding mattress pad from Amazon. However, Utopia Deals only ships to the contiguous US states. Does Utopia Bedding Offer a Trial Period, Return Policy or Warranty? There is no explicitly stated warranty and no trial period, but there is a 30-day return policy and money back guarantee. Note that we’re talking about the official website’s return policy here. Amazon and other online retailers may have different procedures. Utopia Bedding’s policy does not include free return shipping, unless the return is because the item delivered is incorrect. Returned items also need to be unused and unopened. 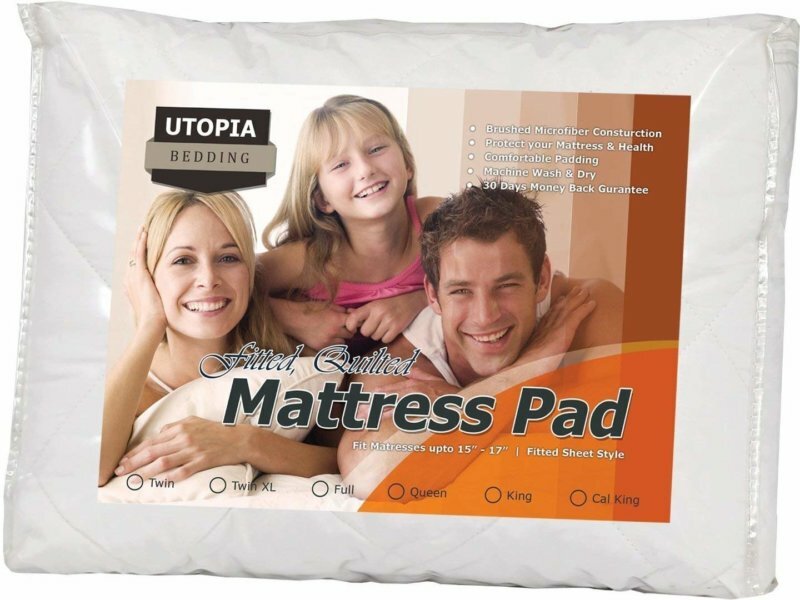 Visit Amazon & Find Utopia Bedding Mattress Pad Deals Now! If you’re looking for a low cost, no nonsense mattress pad with no special considerations, the Utopia Bedding Fitted Quilted mattress pad will serve you well—though there may be more affordable options out there. The lack of a trial period or clearly stated warranty really bothers us, but the price point isn’t high enough for this to be a deal breaker. If you find that the Utopia Bedding mattress pad isn’t a good fit for you or your mattress, it may still be serviceable as a mattress pad for your guest bedroom. It can also provide added padding underneath another mattress pad, or be used to secure a mattress topper. The real issue is comfort, and most of the feedback we saw regarding this was positive. However, if you find the mattress pad itchy or too much of a barrier between you and your cooling mattress, that’s a problem. Bottom line: If you’re not picky or particularly sensitive, the Utopia Bedding Fitted Quilted mattress pad will suffice. This is also great for mattresses that don’t get used regularly. Don’t expect anything but basic coverage and a very slight plushness, though.